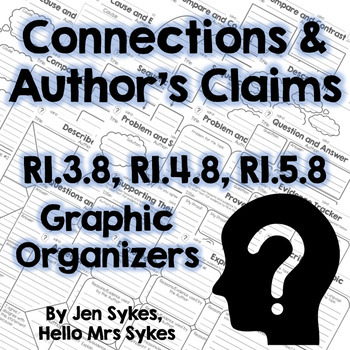 The Connections and Author's Claims Graphic Organizer set is perfect to teach, practice, or assess Connections (RI.3.8) and Author's Claims (RI.4.8 and RI.5.8) in informational text. This newly revised collection of reading comprehension comprehension graphic organizers are adaptable for a wide variety of text and Common Core aligned for third-fifth grade. Whether you use Strategy Groups, Literature Circles, Guided Reading, Daily 5, CAFE, Reader's Workshop, or other literacy structure, this set will be a helpful resource for your classroom. This collection of Reading Comprehension graphic organizers can be used with any texts you already use, while allowing you to confidently ensure you have documentation for the ELA standards using connections between texts and the evidence authors use to support their claims in Informational Text. Feel free to use these to best meet the needs of your students: independent work, partner work, small group work, whole group work, or even for homework! 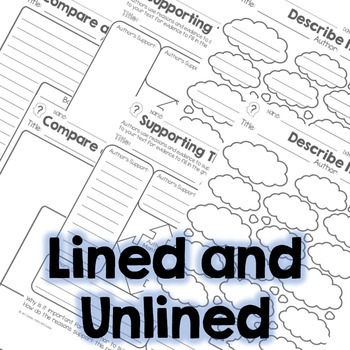 This straightforward packet is easy to understand for use with volunteers or paraprofessionals, yet complex enough to engage students in repeated readings. 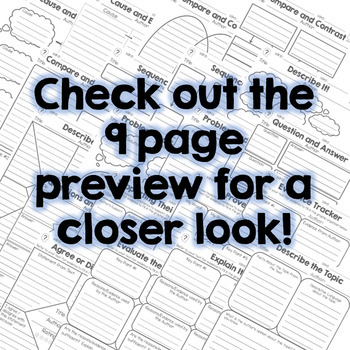 The Tips from Jen page gives you additional ideas for implementation in your classroom. For a closer look, please download the 9 page preview. This packet is created by a K-12 Literacy Specialist, carefully aligned with CCSS, and tested in classrooms. 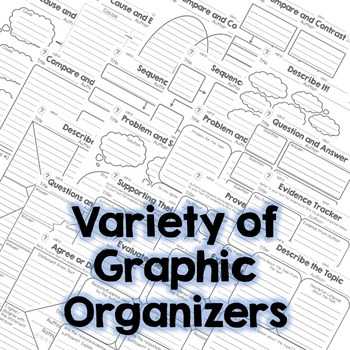 Looking for Graphic Organizers for grades 3-5 for Fiction? Click here to view a similar set, designed especially for fiction texts. Want TPT credit to use on future purchases?